LILONGWE, Malawi – World Food Programme has distributed in-kind food assistance and cash transfers to over 4.6 million hunger-stricken Malawians. The UN agency has made the revelation in “WFP Malawi Situation Report” released on December 9 week. “The response is done in a phased approach with more than 4.6 million people reached with in-kind food assistance and cash transfers to date. While the imperative to save lives remains paramount, WFP is also scaling up safety nets and resilience-building activities,” WFP says in its report. Over 6.7 million Malawians out of the country’s 17 million population are in need of relief food assistance in 24 districts affected by acute food insecurity. After two successive droughts, Malawi is now diverting almost half of its budget for state-sponsored fertiliser subsidies to irrigation. Malawi’s agriculture minister George Chaponda told csjnews.org that from the fertiliser subsidies annual budget of $98 million, government is redirecting $40 million to irrigation. He attributed the change of strategy as a tactic to counter climate change. With about three million Malawians poised to require food aid, Chaponda said Malawians were bearing the brunt of climate change. He said $40 million diverted from subsidy programme would prop up irrigation by buying pumps, engines and modern treadle pumps for 285,000 smallholder farmers, among other investments. “By empowering these smallholder farmers, we expect to realise improved production of crops grown through irrigation,” explained Chaponda. Malawi has over the past ten years spent about $800 million on Farm Input Subsidy Programme, an intervention aimed at improving food security by addressing resource poor smallholder farmers’ affordability constraints in purchasing fertilisers. The fertiliser subsidies benefits 1.5 million poor farmers, but Chaponda says following the strategy change only 900,000 are the beneficiaries this year. “Amidst the effects of climate change, hunger continues to haunt the beneficiaries of the programme who only depend on rain-fed agriculture,” says Chaponda justifying what it is necessary to switch to irrigation. 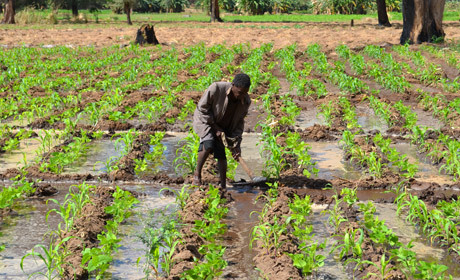 Malawi has an ambitious Irrigation Master Plan is aimed at increasing the current irrigated area of 104 000 hectares by a total of 116 000 hectares with an investment of $2.4 billion by 2035. The country never explains how it intends to raise that huge amount but simply emphasises on its benefits. This year’s El-Nino impact hit hard the southern African nation which is still recovering from the devastating floods of last season. Last year, floods which killed 106 people affected 1.1 people and damaged 64,000 hectares of crop fields. According to the Malawi 2015 Floods Post Disaster Needs Assessment, the floods damaged property and caused losses estimated at US$335 million. Malawi is not the only country in the southern Africa suffering from the consequences of drought as its neighbours are also facing the same crisis. Mozambique has already started giving food aid to about 500,000 of its nationals worst affected by drought. Zimbabweans is also struggling to raise $290 million to feed up to 4.5 million people. South Africa, conventionally a regional breadbasket, is just convalescing from last year’s drought. The World Food Programme warned in March that almost 16 million people were already food insecure in southern Africa and recently the figure was revised upwards to about 32 million by the Southern Africa Food and Nutrition Security Working Group.